In 2010, the Deseronto Public Library is celebrating its 125th year of serving the people of the town. This is the first in a series of posts on the Library’s early history to mark this anniversary. 1. The Librarian shall, under the direction of the Board of Management, have the charge and superintendence of the Library, News Room and Premises, and shall be responsible for the care and safety of all books and other public property contained in them; shall enforce all regulations, collect all fines, and pay over the same to the Treasurer; must cut the leaves of new books, magazines etc before placing them on the shelves; shall issue no book unless the Library Card is presented at the time of drawing and the book registered thereon. 2. 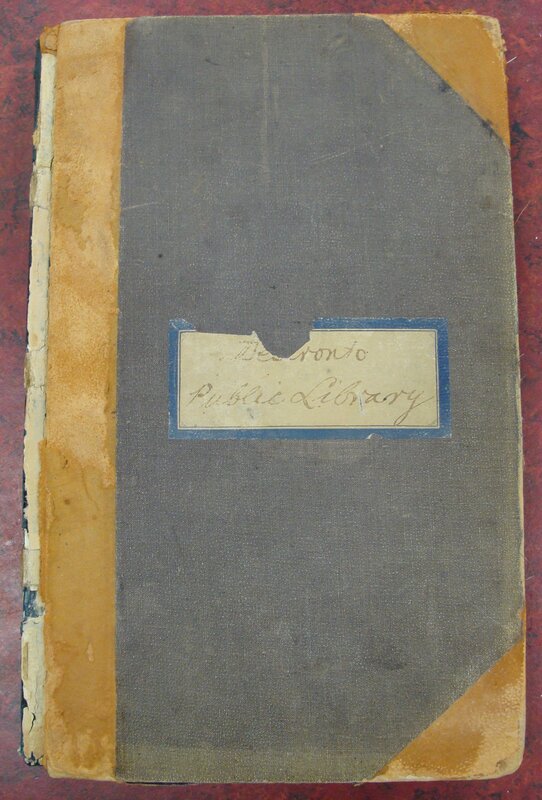 Any resident (Of Deseronto) over the age of twelve years shall be entitled to the privileges of the Library and News Room, upon signing the application and otaining the signature of one ratepayer (who must be approved of by the Board of Management) to the required guarantee or on making the Cash deposit. The signature of any ratepayer of the Town will be sufficient guarantee for himself. 3. When the ratepayer who has signed the required guarantee, desires to withdraw from it, he must give notice thereof, in writing, to the Secreatary of the Board, who will give a release as soon as it shall have been ascertained that no liability exists. 4. The privileges accorded in consequence of the required guarantee may be revoked at pleasure by the Board of Management. 5. Borrowers are especially cautioned against losing the Library Cards, as they will be held responsible for any book that may be taken out with such ticket. When a ticket is lost or rendered unfit for use, the borrower will be charged five cents for a new one. 6. Only one book can be drawn at a time and on one day. No book can be kept longer than fourteen days, but a book may be redrawn for seven days and repeated until asked for. 7. Books of Reference are not to be taken from the Library Rooms. 8. No one shall be permitted to take books from the shelves except the Librarian and assistant and members of the Board of Management. 9. Noise, audible conversation, or disorderly conduct in the Library and Reading Room is strictly prohibited. 10. The Library and News Room shall be open each lawful day, except the ordinary holidays, and such other days as the Board of Management may direct, from 7 P. M. to 10 P. M.
11. No Book shall be issued unless the Library Card is presented at the time of drawing. 12. Readers desirous of proposing books, periodicals or newspapers for addition to the Library, may do so by writing the same on a suggestion card and leaving same in charge of the Librarian. 13. The Librarian, or any member of the Board may suspend from the use of the Library and News Rooms, for a period not to exceed thirty days, any person repeatedly violating any of the Rules and Regulations, and shall report the same to the proper Committee. 14. Strangers and visitors in the Town shall be entitled to the privileges of the Library and News Room on furnishing the required guarantee. 15. Parties living outside of the Town may be allowed the privileges of the Library on payment of an annual fee of $1.00 each and on furnishing the required guarantee. 16. A fine of one cent for each day up to the value of the volume will be imposed for retaining a book longer than the time allowed by these rules. Fines will be imposed for marking in, or in any way injuring or defacing a book or magazine. 17. In cases where there has been any contagious disease in a house during the time a book belonging to the Library has been there the fact must be reported to the Librarian when the book is returned. 18. These regulations, or any of them, may be repealed or amended, and new Regulations may be made at any Regular Meeting of the Board of Management, a notice of at least one week being given of the proposed change by the proposer to each member of the Board and the majority of the Board concurring. Things have moved on a little in the Library today. The staff will let you take books off the shelf yourself and borrow more than one at a time. They even let children under twelve join the library!